4–5 minutes or until lightly golden. Add the almond and cook for a further 2–3 minutes or until the almond is toasted and the crumbs are crisp. Transfer to a small bowl and set aside. While the breadcrumbs are cooking, cook the asparagus in a large saucepan of salted boiling water for 2 minutes or until tender. Drain well, place on a large serving platter, and sprinkle over the garlic oregano crumbs and lemon rind. 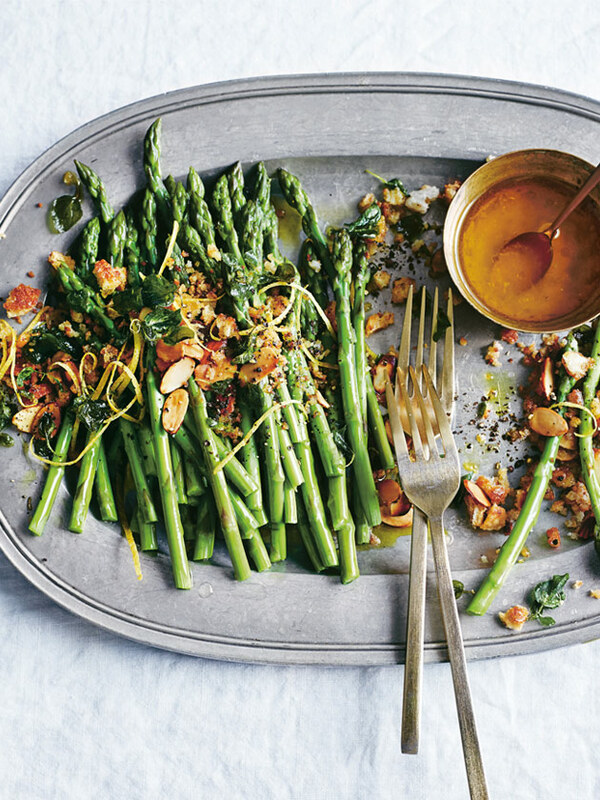 Place the lemon juice, salt, pepper and remaining oil in a small bowl, whisk to combine and drizzle over the asparagus to serve. Serves 6–8. 3 bunches of regular asparagus.